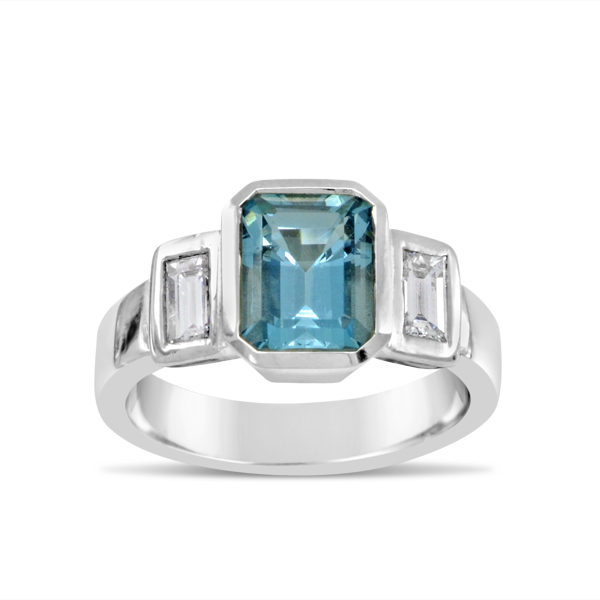 Emerald Cut Aquamarine Diamond Ring. The ring pictured has a 10mm x 8mm Aquamarine and two 0.5ct emerald cut diamonds either side mounted in platinum and costs £4000-£5000 depending on the quality of the stones used. We can change the scale and price of this ring by altering the metal and stone size or type. The range of size for the centre stone starts at 6mm x 4mm and goes up to 18mm x 15mm. Just email me with your requirements.